Amy was a strong, brave woman who cared deeply about other people and whose life was dedicated to helping children with speech problems. 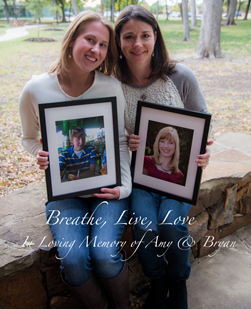 A beloved wife, mother, daughter, sister, and friend, Amy died suddenly at the age of 38 after a brief illness. Amy’s wish to donate her organs saved the lives of six people while her donated tissue helped scores of others. Carrie and her brother Bryan were strong and brave, too, but both of them struggled with cystic fibrosis. Bryan lost his battle with the disease while waiting for a transplant. Carrie would have shared Bryan’s fate, but at the last moment she received a healthy pair of lungs from Amy. Carrie and Amy’s families are now close, sharing a unique and loving bond. Carrie and Amy’s sister Valarie enjoy being with each other, and last November, in memory of Amy and Bryan and as a symbol of hope and of overcoming challenge, Carrie joined Valarie to finish the Cowtown Marathon in Fort Worth together. The picture below is of Carrie holding a photograph of her brother Bryan and Valarie holding a photograph of her sister Amy. Amy and Valarie, and now Carrie, are my nieces. I am so humbled and pleased that you have chosen to feature their story. We miss Amy every day but I am so grateful that Carrie lives a happy and healthy life because of Amy’s gift. Talk about a “blended” family! 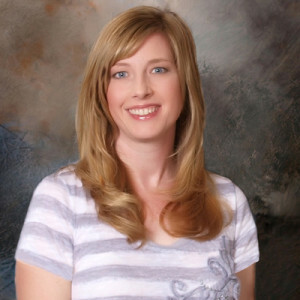 I hope Amy’s story will inspire others to register to be an organ donor. I also know that donor families always hope that the people that receive this precious gift will reach out to say “Thank you.” It helps more than you can imagine. So I hope that Carrie and Valarie’s story will inspire other transplant families to contact their donor families and perhaps build their own blended families.